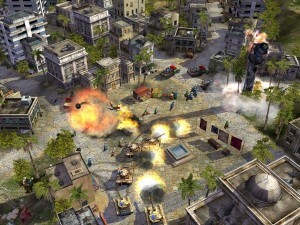 Command & Conquer Generals is the latest game in a series that goes back to the genesis of real-time strategy gaming. In fact, Command & Conquer played a big role in launching the genre to its current level of popularity. This entry in the series takes some evolutionary steps, most notably the move to a fully 3D environment, but also delivers the solid strategy gameplay and imaginative units for which Command & Conquer is known. The antagonists this time around are the US, China, and the Global Liberation Army, or GLA. The GLA is a fictional terrorist organization that bears more than a passing resemblance to the Islamic extremist groups that are getting more than their fair share of press these days. The game is set sometime in the near future as the well-armed GLA begins to make life miserable for everybody else. That's about all there is for a story, though. In a departure from previous games in the series, Generals dispenses with the cutscenes and narrative that are normally a part of Westwood's games. You get a voiceover introduction to each mission at the load screen, but the missions do not form a cohesive storyline as in prior Command & Conquer games. You can skip around between the campaigns for each of the sides and not really miss anything by doing so. Veterans of the series will see some other changes in Generals. Gone is the cool install program that would take over your computer and pump you up to get at the game, replaced by a standard, utilitarian install. The long progressive single player campaign has been replaced by a disjoint and short set of missions as the game shifts the emphasis to skirmishes and multiplayer action. Structures can now be built anywhere, the interface has been moved to the bottom of the screen, and the absence of naval units are just a few things in the collection of changes in store for the Command & Conquer fan. And sadly, there's no Tanya. Don't get me wrong, these changes are not all bad, but it should be noted that the game has gone through a lot of changes since Red Alert 2. It's sad to see the cutscenes gone, but when you get down to it what really matters is the gameplay and Generals delivers on this point. Generals continues the Command & Conquer tradition of high-speed, non-stop action, and provides players with three unique factions armed with a variety of imaginative weapons.